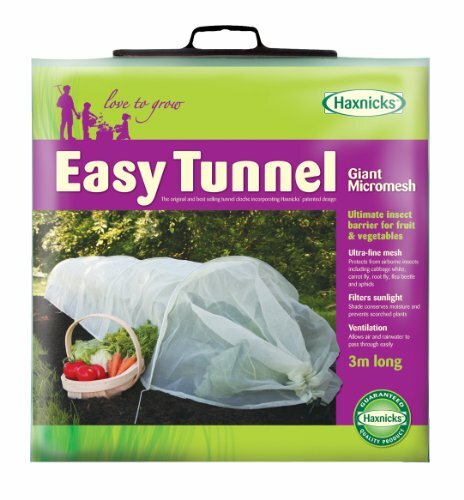 Protect your plants & extend your growing season with the Haxnicks Giant Micromesh Tunnel. Stronger plants & quicker growth! Ultra-fine 0.6mm mesh keeps out even the smallest of insects, so no need for harmful chemicals. Generous size - 9.8 feet long, 24 Inch wide, 18 Inch high. Great for larger plants or cover a double row. Also availalbe in smaller size, as well as other materials. For nearly 20 years, the Haxnicks company has been designing and manufacturing innovative garden care and plant protection products for their customers in England. Tierra Garden is proud to offer this distinctive line in the United States. Ultra-fine mesh forms an ULTIMATE barrier against insects, birds, animals, and frost, while allowing air and water to pass through easily and providing shade to retain moisture. Made from long-lasting UV-stabilized, high-density 0.6mm ultra-fine mesh polyethylene with rust-proof, galvanized steel hoops, which easily go into the ground to secure and keep the tunnel in position.